Many new PCs come with solid state drives because SSDs make booting up your PC and accessing data faster. But adding an SSD to an existing computer can be a problem. Most of us can't afford an SSD big enough to carry all our data. And combining an SSD with a traditional hard drive means lots of futzing to get all your most frequently accessed data onto the SSD drive. New solid state cache drives due from Corsair later this month should give upgraders a significant SSD speed boost without draining their wallets. The drives are relatively small and inexpensive: 30GB for $69, 45GB for $84 and 60GB for $99. But they come with software that analyzes what you use most frequently. They automatically place those files on the SSD, meaning that your computer should start more quickly and the games and programs you use most should load and run faster. The idea may sound familiar. With Windows Vista, Microsoft introduced ReadyBoost, a way to improve performance by caching data on a Flash memory stick attached to the PC. ReadyBoost never really caught on, in part because the first version of Vista didn't properly maintain the cache when the machine went to sleep or was shut down. 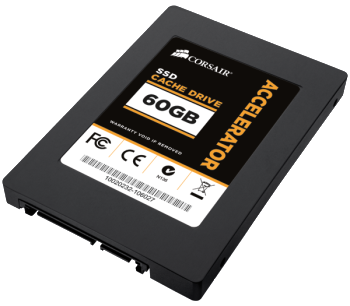 If Corsair's solid state cache drives work as intended, though, they could give you a lot of bang for relatively few bucks.